Very pretty little plate. Backstamp: Pembroke above printed caduceus with Bisto England below. Crazed otherwise excellent condition. Delightful little dish with cover. Backstamp: Pembroke (partly missing)above printed caduceus with Bisto England below. Light all over crazing, overall excellent condition. With gilt. A beautiful little set of stand, tureen, cover and wonderful little ladle. Backstamp: Rosamond Bisto England, impressed Rd 264597 and in red script B930. There is a little wear to the gilt on the cover and a few minor blemishes to the stand otherwise in excellent condition. Lovely little flow blue plate. Backstamp: Delhi B & T Light all over crazing. With gilt. Originally with a cover, this would have been a sample that a salesman showed to retailers, tempting them to stock Real Old Willow. Backstamp: Booths Silicon China for Dinner, Tea, Dessert, Toilet Services etc. Excellent condition. With gilt. This would have been a sample that a salesman showed to retailers, tempting them to stock Real Old Willow. Backstamp: Booths Silicon China for Dinner, Tea, Dessert, Toilet Services etc. Light all over crazing, a little wear to the gilt and there are a couple of horizontal hairlines to the rim of the cover, which are barely evident when the cover is in situ'. With gilt. Backstamp: Booths Silicon China for Dinner, Tea, Dessert, Toilet Services etc. This plate would have been the sample that a salesman showed to retailers, tempting them to stock Real Old Willow. Crazed otherwise excellent condition. Provenance: The Entwistle Collection. With gilt. Backstamp: blue printed Booths Silicon China for Dinner, Tea, Dessert, Toilet Services etc. and script 9072 on the saucer. No backstamp on cup. This tiny cup and saucer would have been the sample that a salesman showed to retailers, tempting them to stock Real Old Willow. The glaze is finely crazed, otherwise excellent condition. Provenance: The Entwistle Collection. With gilt. Backstamp: T Goode & Co South Audley St London W A very unusual piece. Light crazing otherwise in excellent condition. Provenance: The Entwistle Collection. With gilt. Backstamp: Booths Silicon China for Dinner, Tea, Dessert, Toilet Services etc This would have been the sample that a salesman showed to retailers, tempting them to stock Real Old Willow. The base is in superb condition. The cover has a chip to the rim, fairly discreet when it is in situ'. Provenance: The Entwistle Collection. With gilt. These would have been part of a sample set a salesman would have shown to china retailers, tempting them to stock Real Old Willow. Backstamp: Booths Silicon China for Dinner, Tea, Dessert, Toilet Services etc. Excellent condition. Marked examples of this toy china are recorded made by George Frederick Bowers of Tunstall active 1842-68. It is a rarely found design in toy china. This pretty little piece has a few signs of age or play, with the inside neck rim "nibbled", although this does not show when the cover is in place and there is light staining and a firing crack inside. From the outside and on display it looks fine. No maker's backstamp. 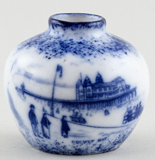 Tiny vase showing Colwyn Bay. Backstamp: Foley China E B C Est 1850 Trade Mark and on front of vase Colwyn Bay. The occasional minor blemish and a very small minor stain overall excellent condition. Tiny vase of Mauldslie Castle Carluke. Backstamp: Foley China E C B Est 1850 Trade Mark. and on front of Vase Maldslie Castle Carluke. One or two minor blemishes overall excellent condition. Foley China. Lovely little piece featuring Mauldslie Castle, Carluke, Lanarkshire. The castle was erected in 1792/3 by Thomas Fifth Earl of Hyndford and was later the seat of Lord Newlands. The Castle has long since been demolished but the Gate House still stands. Made in England. Brand new and first quality, dishwasher and microwave safe. Dark Blue Victorian Chintz. This item has been discontinued by Burleigh and is no longer available. Made in England. Brand new and first quality, dishwasher and microwave safe. Pink Victorian Chintz. This item has been discontinued by Burleigh and is no longer available. Made in England. Brand new and first quality, dishwasher and microwave safe. Pale Blue Willow.This item has been discontinued by Burleigh and is no longer available. Bone china with gilt. Delightful little cup and saucer with artists name M Grant and Christmas 1978 in script on both cup and saucer. Backstamp: Caverswall England. Excellent condition. Bone china with gilt. Delightful little cup and saucer with artists name M Grant and Christmas 1979 in script on both cup and saucer. Backstamp: Caverswall England. Excellent condition. Bone china with gilt. Delightful little cup and saucer with artists name M Grant and Christmas 1980 in script on both cup and saucer. Backstamp: Caverswall England. Excellent condition. Bone china with gilt. Delightful little cup and saucer with artists name M Grant and Christmas 1981 in script on both cup and saucer. Backstamp: Caverswall England. Excellent condition. Bone china with gilt. Delightful little cup and saucer with doves and floral decoration and the text "Be My Love". Backstamp: Caverswall England. Excellent condition. Bone china with gilt. A delightful romantic inspired pattern with sweethearts and lilies with the text L'amour. Backstamp: Caverswall England. Excellent condition. Bone china with gilt. Backstamp: Coalport Bone China Made in England est 1750 Hong Kong. Excellent condition. Bone china with gilt rim. Excellent condition. Backstamp: Bone China Coalport Made in England Est 1750 Hong Kong. Bone china with gilt rim and gilt highlights. Lovely colour combination. Backstamp printed in orange Bone China COALPORT Made in England Est 1750 HONG KONG. Bone china. Backstamp: Bone China Coalport Made in England Est 1750 Indian Tree. Excellent condition. Bone China. Backstamp: Coalport Bone China Made in England Est 1750 Indian Tree. Excellent condition. Bone China with gilt. Backstamp: Coalport bone china Made in England Est 1750 Indian Tree. Excellent condition. Bone China with gilt. Excellent condition. Backstamp: Coalport bone China Made in England Est 1750 Indian Tree. Bone china with gilt rim. Excellent condition. Backstamp: Bone China Coalport Made in England Est 1750 Indian Tree. Bone China with gilt. Excellent condition. Bone china with gilt. An absolutely gorgeous very small two handled dish with cover. Backstamp: Coalport Bone China Made in England Est 1750. Excellent condition. Bone china with gilt rim. Backstamp printed in grey Bone China COALPORT Made in England Est 1750 Pageant. Delightful design on miniature cup and saucer. Backstamp printed in gray is Bone China with crown, COALPORT, Made in England, Est 1750 and PAGEANT. Bone china with gilt rim. Backstamp: Bone China Coalport Made in England Est 1750 Strawberry Excellent condition. Bone china. An absolutely gorgeous miniature set of teapot, plate and cup and saucer. Backstamp: Coalport Bone China Coalport Made in England Est 1750. Excellent condition. Lovely miniature bone china cup with gilt rim. Backstamp: Bone China COALPORT, Made in England Est 1750 WILLOW. Excellent condition. Bone China with gilt. 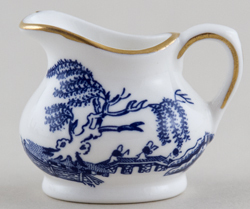 A delightful little jug. Backstamp: Coalport Bone China Made in England est 1750 Willow. Excellent condition. Lovely miniature bone china cup and saucer with gilt rims. Backstamp printed in blue Bone China COALPORT, Made in England Est 1750 WILLOW. Excellent condition.